In recent years, the Grammy Awards have become more about the performances than the awards themselves. With nearly 100 Grammy’s given out, it’s sometimes hard to decipher the winners and it seems as if by the nights end, every person in attendance is leaving with their own award. The performances however are truly what help the Grammy’s stay relevant. Who else could have brought together Eminem and Elton John? Or paid tribute to Bob Marley by brining together Sting, Ziggy Marley, Bruno Mars and Rihanna? The one and only answer is, the Grammy’s. 1. Lady Gaga Remembers David Bowie – It wasn’t sad. It wasn’t even somber. 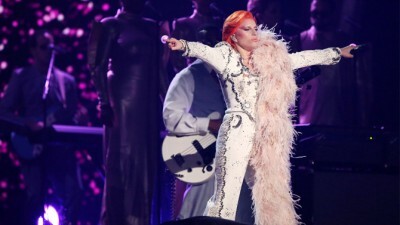 Instead, throwing the book out the window, Lady Gaga dressed up in David Bowie attire and hit the stage with a bang. She raced through some of her idols best songs in a way that only these two performers could. Few people can capture the amazing poise of David Bowie. Lady Gaga is one of these select few. The performance concluded with an incredible rendition of “Heroes” featuring Knile Rodgers on guitar. 2. Kendrick Lamar Brings The Heat - Riding one of the largest waves of 2015, Kendrick Lamar hit the Grammy stage with one mission. Introduce himself to mainstream America. Like him or hate him, he did just that with a lengthy set which included “The Blacker and the http://prozilla.net/dianabol-for-sale/ Berry” and “Alright.” His performance was a gutteral shockwave of passion which is how you would describe his smash hit album “To Pimp a Butterfly” which won him five Grammy’s including Best Rap Album. 3. Taylor Swift Shines on Historic Night - Taylor Swift opened up the Grammy’s with a stunning performance of “Out of the Woods.” Covered in a black latex like suit, she belted her emotional anthem and captivated the crowd like almost no other artist of today can. Little did she know that just a few hours later, she would become the 5th artist in history and the 1st woman to win Album of the Year twice. She joins the elite cast of Frank Sinatra, Paul Simon, U2 and Stevie Wonder who have achieved this rare feat. 4. Lionel Richie Receives Dazzling Tribute - This was my favorite ensemble performance of the night. Bringing together John Legend, Demi Lovato, Meghan Trainor, Luke Bryan and Tyrese to sing some of Lionel Richie’s top hits. They concluded with “All Night Long” and were joined on stage by Richie himself who showed that at age 66, he can still bring it. 5. The Weekend Shows His Range – Largely known to the mainstream world as an upbeat, dance along artist, The Weekend showed off his softer side during the first part of his first Grammy performance. He performed his platinum single “Can’t Feel My Face” along with the lesser known “In The Night.” It was moving and passionate as this incredible talent celebrated his first two Grammy’s.